This is an incredible time of positive change! Time to bring traditional structures and lifeways back in new and exciting ways! Standing Rock is bringing together Indigenous led Water Protectors and Earth Warriors in profound ways, supporting cont.. This is an incredible time of positive change! Time to bring traditional structures and lifeways back in new and exciting ways! Standing Rock is bringing together Indigenous led Water Protectors and Earth Warriors in profound ways, supporting the just transition to locally based and truly renewable energy sources while protecting our Water, Land, and future! We are blending local Indigenous construction techniques that have existed for thousands of years, with the latest in technologies and expertise. This is a new model community that will be climate adaptive as a sacred gathering place for generations to come. There will be Earthlodges (various types - mound, pit house, hogan, etc.) and other green-built structures to serve as a permanent, solar-powered, water conserving, teaching and demonstration buildings; beautiful examples of contemporary Indigenous architecture and engineering. A place to remember and honor the history being made at Standing Rock while celebrating an economy and way of living that is dramatically less dependent on fossil fuels. The Standing Rock Sioux Tribe has been working with the Indigenous Environmental Network to create a profound example of a beautiful, Indigenous sustained community on tribal lands above the confluence of the Cannon Ball and Missouri Rivers. They have brought together a team of partners including Blue Star Integrative Studio, Biohabitats, Kuruks, Sustainable Nations, Give Power , Give Love , the American Indian Council of Architects & Engineers , and many other key partners to design a Village based on the culture of the Standing Rock people and in honor of the Earth and Water. The MNI WICONI SUSTAINED COMMUNITY has been designed with traditional architecture and modern low-impact renewable energy + water/waste systems, blending local Indigenous construction techniques with the latest in technologies and expertise. The Ecovillage will be a climate adaptive model community, a sacred gathering place for generations to come, and a place to remember and honor the history being made at Standing Rock while celebrating an economy and way of living that is dramatically less dependent on fossil fuels. With an initial large donation, the Project has started, but there are many more resources needed! We have a logistical and construction management team in place. There is a budgeted line item cost list prepared by architects, engineers, and general contractors. We have crews ready to begin construction once shipments of materials arrive. There are also cost-matching partners waiting to see how our fundraising goes! Winter is here, the time of going inwards, bringing dangerous conditions that do not allow active construction. Living according to the Earth’s cycles, we are taking this time to build strong partnerships, resources, and financial support to allow us to rebirth the active construction phase of the MNI WICONI Sustained Community in the Spring, constructing at least 7 Earth Lodges, 6 Straw Bale Buildings, 28 Tiny Homes, and 28 Warm Yurts in the Spring of 2017, enabling traditional indigenous people and allies of the Standing Rock Sioux Tribe to continue powerful and prayerful work! 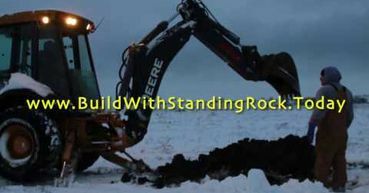 Please consider supporting this profoundly impacting project by contributing at www.buildwithstandingrock.today, or contact us for information on organizing a fundraising circle in your local community, or to offer other support! Thank you SO much for standing by our side as we #BuildWithStandingRock TOGETHER and breathe life into this beautiful demonstration of sustainable Indigenous design and construction that will serve as a long term Heritage Site to show the world the power of Native American prayer and ingenuity! Shared this over social. Will share over the facebook groups later today! It is a fantastic project. Thanks Rosemary and Darren for sending. Thanks for the good news Rosemary. What a Great undertaking A Proud Nation coming together to build infrastructure to share the knowledge of many generations and with technology to make this a sustainable living and teaching place for now and for the future, Hope. Think of how many people will see this and help them build this community. An example for other people to build similar communities all over. the time is now. Shared the link over the 15+ active facebook groups. I had heard others speaking about this but hadn't seen anything concrete about it so am glad you presented this video and fundraiser. This is certainly taking the lemons given to the people of the area and turning it into something much better. I shared with lots of groups on FB and I'll add to the next Dandelion Seeds. If someone wanted to do something for Christmas in honoring say a deceased member of their family or friend perhaps or make a donation in someone's name who has all they need anyway, this would be a good way to do it. TY Rosemary and Darren. Shared on FB. Forgive me for being under the weather and off FB and C2 lately. Back to do the necessary work!! !